Come join us in the cool high mountains of Eastern Arizona where we will be conducting our bear hunts on the 1.6 million acre White Mountain Apache Indian Reservation. Our hunts start in April and run through August, then again in October. There are very few places that can offer the fantastic hunting methods for giant bears that we can. For the Spring bear hunts we have our own exclusive guiding area. Our hunting methods can range from baiting to hounds, predator calling, spot and stock and glassing, all of which can be very effective. 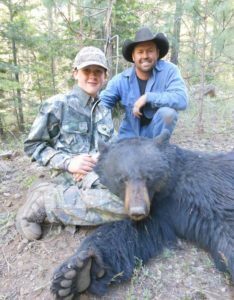 Hunters may purchase a second bear tag prior to the hunt and harvest a second bear for a trophy fee. We can accommodate two hunters and two non-hunters at a time, thus ensuring you are hunting the prime baits and best locations for bears throughout our entire hunting area. This area consistently produces big bears and the potential of harvesting a world class animal is extremely high. The hunting pressure is low and the density of bears is exceedingly high. Bears come in many color phases: Black, Chocolate, Cinnamon and Blonde. It is possible on this hunt to view multiple animals each day, making it possible for a hunter to look over several bears before harvesting. Our hunts generally take place between 5000' and 9000' elevation. Due to the high elevation, hides on most bears are good even through the summer hunting season.Tags are purchased over the counter. All hunters born after 1960 must have passed a hunter safety class. Hunters may also take a lion on this hunt if the opportunity presents itself prior to harvesting a bear for a trophy fee, you would need to buy a lion tag only after a successful harvest. Hunters have the option to purchase a 2nd bear tag ahead of time, Please inquire for details. The Mountain Lion is a magnificent trophy, but an extremely elusive one, requiring the aid of well trained hounds. 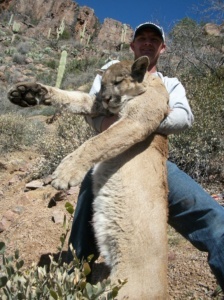 We hunt lions throughout the state including the 1.6 million acre White Mountain Apache Indian Reservation. We specialize in hunting lions on dry ground without any need for snow. However, we will utilize any situation that can effectively increase the odds of a successful hunt. We have an excellent string of riding and packing mules that we use to travel the canyons, bluffs and ridges while looking for lion tracks. The hounds are free cast, hunting with us all day until we strike a track. Occasionally, the use of 4x4 vehicles to locate tracks can be very efficient. Lions may travel long distances in a night so a lot of foot work may be necessary or the mules can come in handy while following the hounds through the rough country, hopefully ending up the day with a lion bayed on a bluff or high in a tree. Tag and license are purchased over the counter at most sporting good stores throughout the state of Arizona. 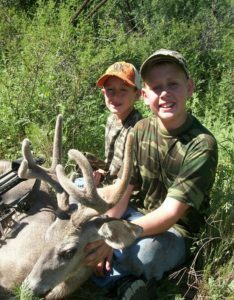 The coues deer has become an extremely desired trophy animal. Arizona has great habitat for these deer and as a result very high numbers of them. We archery hunt these deer in the months of August and September using primarily treestands and ground blinds located near water and good trail systems. Rifle hunting is during October, November and December. During the October- November hunt, the weather is usually very pleasant, bucks are gathered up together away from the large numbers of does, finding these areas is essential. Many times you will have more than one big buck together. On the December hunt we spend our time in search of does finding the right one that is in estrus can result in a big buck close by for at this time of year the rut is on and the bucks are out of hiding. Locating a good buck takes several things: Plenty of pre-scouting ahead of time and hours upon hours of glassing, as these deer may appear nearly invisible on an open hillside. Quality optics are a must on this hunt. Hunts are booked on a first come first serve basis. Get your deposit to us ASAP to secure your hunt date. We can only hold a space for seven days with just a verbal agreement. Space is very limited. For your convenience we have provided the differences between fully outfitted hunts and guide only hunts.